Desert Hills Estates in Green Valley, Arizona is a 55+ community in Pima County. Situated next to the Desert Hills Golf Course, homeowners not only enjoy the natural beauty of the Santa Rita Mountains but also golf course views. Though there isn't an on-site community clubhouse, homeowners can obtain a membership to Green Valley Recreation s network of amenities. This active adult community in Southern Arizona is surrounded by open space and walking paths. In addition, Desert Hills Estates is ideally located just east of Interstate 19, making traveling north to Sahuarita and Tucson a breeze. Residents of Desert Hills Estates can enjoy 13 recreation centers throughout Green Valley. 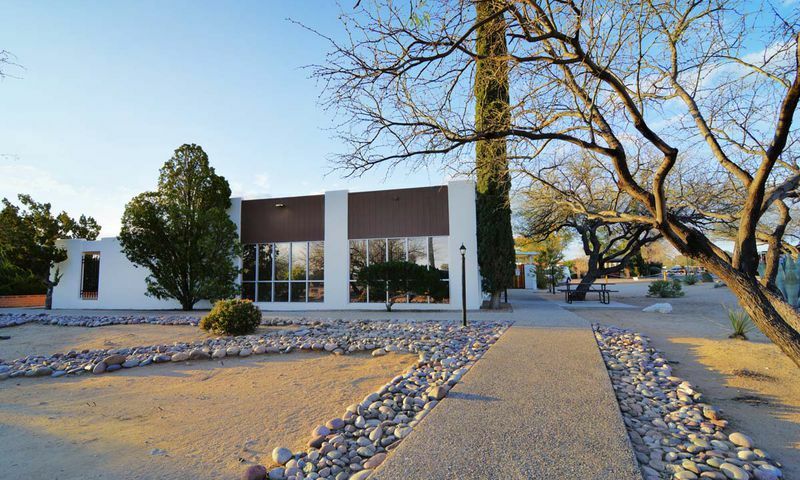 Membership to Green Valley Recreation (GVR) includes multiple ballrooms, meeting rooms, and plenty of hobby studios. Staying fit and healthy is never difficult because GVR offers 5 fitness centers, aerobics and dance studios, indoor and outdoor pools, and miles of walking and biking trails. Those looking for friendly competition can meet friends for billiards, racquetball, table tennis, pickleball, bocce ball, shuffleboard, and tennis. All of these sports courts are located throughout the Green Valley area, but no more than 15 minutes away from Desert Hills Estates. Desert Hills Estates offers the largest homes of all Desert Hills subdivisions. Homebuyers can find a resale home that was built from the late 1970s to late 1980s. These luxurious homes range in size from about 1,900 to just over 4,000 square feet in size. Residences were built with two to four bedrooms, two to three-and-a-half bathrooms, and an attached garage. Some homes even include a guest house and private swimming pools. Desert Hills Estates is a tight-knit neighborhood of just 73 homes however, residents enjoy a myriad of opportunities for leisure and fun. GVR s facilities are the social hub of the Green Valley area and they host a variety of clubs, activities, and events. Activities include bridge, bocce ball, ceramics, hiking, swimming, exercise classes, dance instruction and more. Common interest groups like state clubs, art leagues, and card clubs meet on a regular basis and plan fun events. Desert Hills Estates is located on West Placita de la Cotonia just west of Interstate 19. This 55+ community of spacious low-maintenance homes is located in Green Valley, Arizona. 85% of Green Valley is made up of age-restricted communities, meaning homebuyers are always surrounded by peers. Tucson is located about 33 minutes north and Nogales is about 40 minutes south of Desert Hills Estates. When not enjoying the many area golf courses and warm climate, residents can easily travel with Tucson International Airport just 25 miles north. When looking for a luxurious 55+ home in Green Valley, AZ, Desert Hills Estates is a wonderful option for resale homebuyers. There are plenty of activities available in Desert Hills Estates. Here is a sample of some of the clubs, activities and classes offered here. Desert Hills Estates offers the largest homes of all Desert Hills subdivisions. Homebuyers can find a resale home that was built from the late 1970s to late 1980s. These luxurious homes range in size from about 1,900 to just over 4,000 square feet in size. Residences were built with two to four bedrooms, two to three-and-a-half bathrooms, and an attached garage. Some homes even include a guest house and private swimming pools. Please Note: Floor plans are not available at this time. We bought our home for retirement here because we didn't really want to downsize in square footage and we also didn't want to be in a busy neighborhood. Desert Hills Estates fit the bill because there is not a clubhouse on-site so it's very quiet and relaxing. If we want to use the gym or swim we have a short drive to a bunch of clubhouses. There is always something to do if we want to, or we just stay home and relax. The house has plenty of space, tons of storage and the yard is big, maybe a little too big! 55places.com is not affiliated with the developer(s) or homeowners association of Desert Hills Estates. The information you submit is distributed to a 55places.com Partner Agent, who is a licensed real estate agent. The information regarding Desert Hills Estates has not been verified or approved by the developer or homeowners association. Please verify all information prior to purchasing. 55places.com is not responsible for any errors regarding the information displayed on this website.